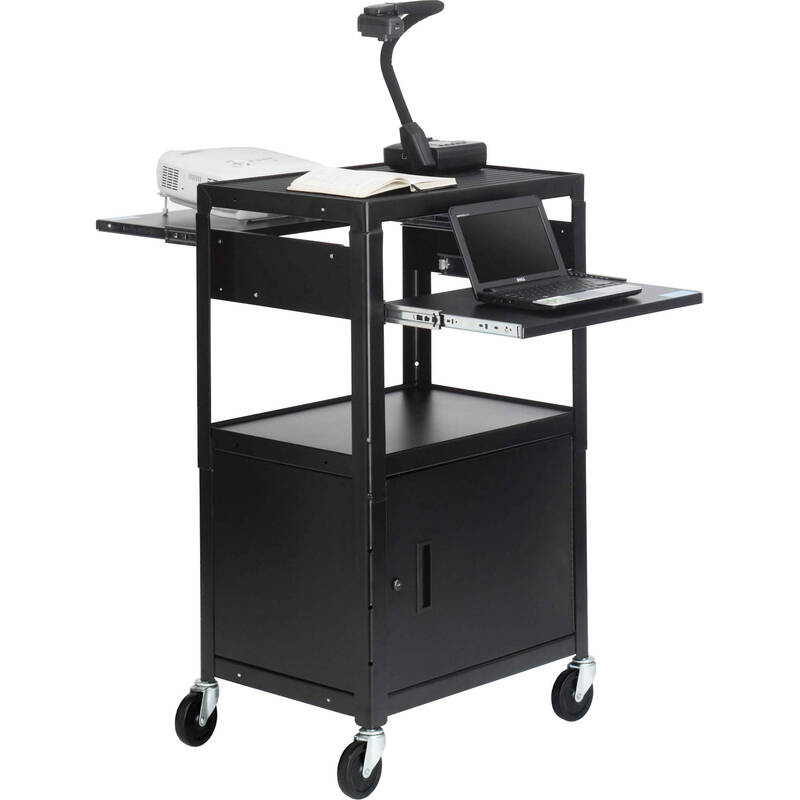 The Bretford CA2642DNS AV Notebook & Projection Cart is a multimedia presentation cart that allows you to carry equipment such as a laptop, data projector, document camera, DVD player, scanner, and more on one compact platform. The two 14”D pull out shelves offer extra workspace and support equipment weighing up to 15 lb (6.8 kg), each. Positioned on the opposite sides of the cart, the shelves move smoothly on 14" (35.6 cm) rolling glides. The shelf supports are arc welded to the leg supports, which translates to a wobble-free, secure platform for your equipment. You can adjust the top shelf to 3 different heights of 34"(86.4 cm), 38" (96.5 cm) or 42"(106.7 cm) by simply resetting 4 screws. Additionally, a 1/4" lip on the shelves prevents the equipment from sliding off during transport. The lower storage cabinet can be locked (2 keys included) and has a rear grommet hole for routing power cords. Equipped with 4 smooth glide castors (2 locking), the AV Notebook and Projection Cart can be easily maneuvered from one location to another. Box Dimensions (LxWxH) 31.75 x 26.0 x 20.5"